Well, much can be said about these machines. They are made with vision, care, sweat, iron and a great deal of skill from one of our most loyal members, who also plays a vital part in our gym community (and “bodybuilder’s paradise” or so the rumour has it on Twitter). 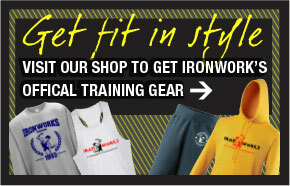 Iron Works boasts with a massive selection of great varied machines, most of them belonging to Reflex Sports, a company owned by Jon Bembridge. We would like to dedicate this post to him and to his custom made machines that occupy Iron Works and make this gym so unique. For most of you that do not know, Jon has been a loyal member of Iron Works and has been training here since the opening of the gym in 1993. He is the man responsible with the conception of these machines and without him, the face of Iron Works would be a very different one. In fact, a new back machine has arrived today from Reflex Sports. Give it a try and let us know how it feels.